PT Indoxing Karya Mulia was established in Indonesia to provide Engineering, Procurement and Construction (EPC) services to power plant, oil, gas, petrochemical and refinery industries in Indonesia. PT Indoxing Karya Mulia was also appointed by CPI Fujian Power Engineering Co. Ltd as their agent for the 9 mini Hydro Power Plant Project in Sumatra, Indonesia. 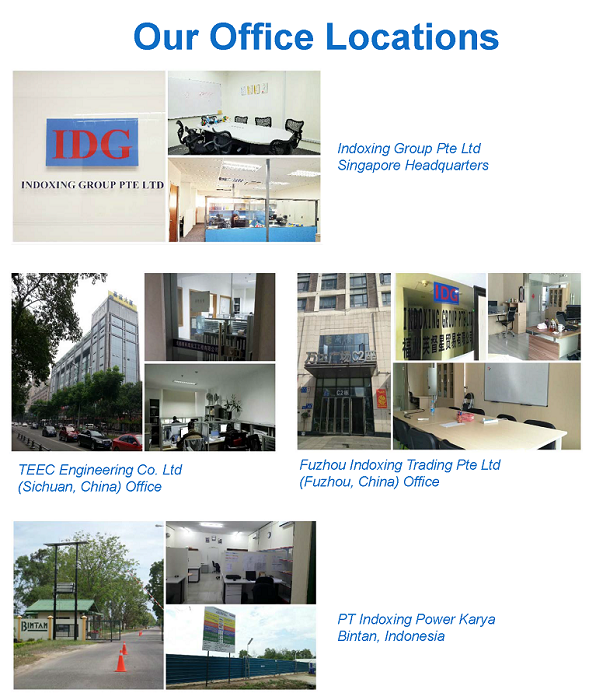 Indoxing Group Pte Ltd was set up in Singapore to serve as the headquarter and key contact point. PT Indoxing Karya Mulia was subsequently listed as our associated company. PT Indoxing Karya Mulia was appointed by STA Detroit Diesel – Allison (Singapore) Pte Ltd (SDDA) as their Indonesian Representative. SDDA is a wholly-owned subsidiary of Singapore Technologies Kinetics (The ST Engineering Group) which is engaged in the distribution of heavy duty MTU Engines, Detroit Diesel Engines, Mercedes Engines, VM Engines, Allison Transmission and related products, field/offshore technical services and repair/maintenance services. To further enhance our presence in Indonesia, PT Indoxing Power Karya was established in Indonesia as our associated company to develop, construct and operate power plants and industrial plants. Fuzhou Indoxing Trading Co., Ltd. was established to facilitate export of China’s equipment for overseas projects. 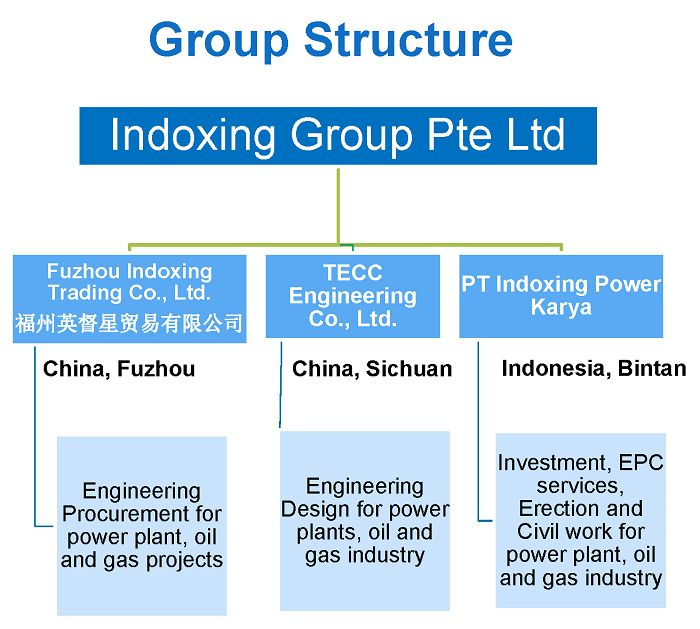 TECC Engineering Co., Ltd. became an associated company of Indoxing Group Pte Ltd. which specialises in the field of petrochemical and liquid chemicals tank design. TECC Engineering Co Ltd is located at Chengdu China which provides both basic design and detail engineering services for power plant and oil & gas industry. Copyright © 2009-Present Indoxing Group Pte Ltd. All Rights Reserved.